Objects and new themed features for Minecraft. 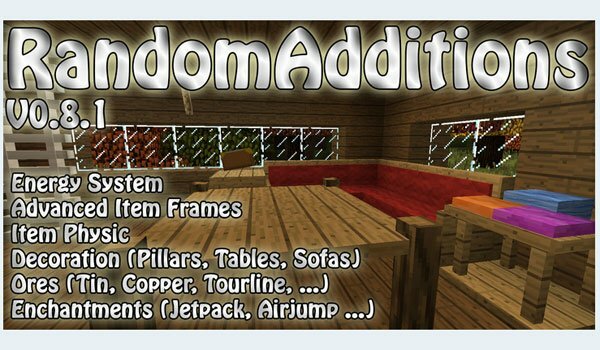 Random Additions 1.7.2 and 1.7.10 is a mod that as you can guess by its name , adds various elements without much connection between them , as the author has added blocks, objects and functions to his needs or criteria . Right now the mod adds new ores , with which you can develop new weapons, armor , decorative items and and other ones more functional . It also incorporates a power system , which allows us to convert the movement of water or wind energy using water mills and wind , in addition to copper cabling for distribution. There are several and varied elements that this mod adds , also including large frames to display weapons , new physics for objects and fluids, decorative objects like sofas and tables, besides new spells and new table for enchantments. These are just some of the new features that this mod adds, you will have to play it to discover what else is inlcuded! How to install Random Additions Mod for Minecraft 1.7.2 and 1.7.10?